Rabbi Jonathan Cahn is the author of two best selling books, The Harbinger (published 2011) and The Mystery of the Shemitah (published 2014). His books have created quite a stir among Christians all over the world with his revelations of ancient mysteries. I have read many articles about him on the internet. Some people believe he is a prophet from God, while others see him as a false prophet. Each person will have to decide for himself/herself whether you believe what he has to say. After reading both of his books and hearing him speak on television, I do not believe he would call himself a prophetic prophet. His books do not foretell the future, but instead reveal an ancient mystery. This mystery is the timing of God’s events throughout history based on the Jewish lunar calendar. You cannot argue with the facts that he presents in both of his books. The true question you should ask yourself is whether or not you believe that the spiritual gift of prophecy still exists today. Some believe this gift died out with the apostles, while others believe God still has His prophets. Is Jonathan Cahn a prophet? In the Bible the prophets were sent by God to proclaim the message of the Lord and warn of future judgment. Sometimes they foretold the future, but many times they just had a word from the Lord. I believe that Jonathan Cahn falls under this category of telling us a word from the Lord. He is warning America of future judgment, if we do not repent as a nation for our sins. He is not predicting dates, but rather has set forth a pattern which God has used throughout history of previous judgments. Jonathan has said that God does not have to follow these patterns, because He is God, but if you look at his patterns judgment is near. How can anyone argue with this statement? It is so obvious with the pandemic diseases, increase in natural disasters and wars and rumors of wars that we are approaching the end times (see Matt. 24). Even if you are a skeptic, I recommend you read Jonathan’s books with an open mind. My next question is, “Why would God choose Rabbi Jonathan Cahn to give us these warnings”? Let me teach you the ancient mystery of the Kohen. Who or what is a Kohen? When Moses was leader of the Israelite, Hebrew or Jewish people, the Lord told him to divide the people into 12 tribes. The tribes were named after the 12 sons of Jacob. Jacob was the son of Isaac and grandson of Abraham. Jacob’s name was eventually changed to Israel, hence the name of the nation of Israel. His 12 sons were Reuben, Simeon, Levi, Judah, Dan, Naphtali, Gad, Asher, Issachar, Zebulun, Joseph and Benjamin. However, the Levites were not considered a tribe because they were the priests and did not receive a land inheritance. Instead, they lived in cities located within each of the 12 other tribes. In order to still have 12 tribes, Joseph’s family received a double portion because of his hardships in Egypt. His tribe was divided into two tribes named after his two sons Mannasseh and Ephraim. There is not a tribe called Joseph. Moses and Aaron were from the family of the Levites. Aaron became the first High Priest. All of the members of the Levites had duties in relation to the sacrifices and the tabernacle, but the High Priest had to be a direct descendant of Aaron. “Now take Aaron your brother, and his sons with him, from among the children of Israel, that he may minister to Me as priest, Aaron and Aaron’s sons: Nadab, Abihu, Eleazar, and Ithamar” Exodus 28:1 (NKJV). What is the mystery of the Kohen? The mystery begins with the Kohen or Cohen, a Jewish priest. The word Kohen is taken from the Hebrew word Kohanin meaning a Jewish priest who is a direct descendant of Aaron. Because all high priests had to be from the line of Aaron, they came up with a way to identify themselves by the use of certain last names or surnames. These surnames are still in existence today. Some of the English surnames are Cohen, Cahn, Conn, Conway, Cohan and Chaplan (1). Do any of these names look familiar? It just so happens that Jonathan Cahn’s last name is one of these surnames. Jonathan is not considered a priest by the Jewish religion, but is only a Rabbi. Anyone can be a rabbi, but I believe that it is interesting that he is a direct descendant of Aaron. Several prophets in the Bible were Levites and some descendants of Aaron, including: Ezra the High Priest (Ezra 7:1-5); Ezekiel (Ezek. 1:3); Jeremiah (Jer. 1:1), Zecharias, who was John the Baptist’s father (Luke 1:5); Elizabeth, mother of John the Baptist and direct descendant of Aaron (Luke 1:5); John the Baptist (Luke 1:5); Caiaphas, an unlikely prophet (John 11:51); Barnabus (Acts 4:36). What are the chances that God would choose a descendant of Aaron to be an end-time prophet? In case you are still a skeptic, I heard Jonathan say on “The Jim Bakker Show” that he was a direct descendant of Aaron. It amazes me that God has preserved this priestly line for almost 4,000 years. He preserved them through their last names, but He also has preserved the line through a more scientific method. A simple DNA test can show whether or not a Levite is a descendant of Aaron. The descendants of Aaron have a marker on their Y chromosome, which no other people possess. I am not a scientist, so you may wish to read this article for more information: Discover Magazine. Why would God preserve the priestly line? Why would God need to preserve the Levite priests after all these years? Especially since Jesus is the last High Priest forever(Heb. 5:5-6, 10). During the tribulation period, a third temple will be rebuilt in Jerusalem where temple sacrifices will presume. The Levite priests will perform these duties. So there you have it, the Mystery of the Kohen. We have a man named Jonathan Cahn, who is a descendant of Aaron the High Priest, who has written two books warning America of judgment. Perhaps we ought to lend him an ear and listen to him with an open mind and heart. God is calling America to repentance. He has been calling for some time, but are we listening? The Jewish people were allowed to occupy Israel in 1917, for the first time in almost 2000 years. In 1948 Israel became a nation. In 1967 they gained control of Jerusalem. According to the Bible, the prophetic clock began ticking when Israel was reborn. Jesus said, “Truly I say to you, this generation will not pass away until all these things take place” Matthew 24:34 (NASB). A generation in the Bible is about 70 years – 80 years (Psalm 90:10) so 70 years after 1948 will be 2018. I can’t say whether anything will happen between now and 2018, but I can say it is time to repent and get right with the Lord. It is time to repent, because the Lord will not continue to call forever. Eventually the door to the ark was closed, Israel was taken into captivity by the Assyrians and the Babylonians, the disciples waited too long to pray in the Garden of Gethsemane. Don’t wait until it is too late, America. You don’t want to miss the calling of the Lord. Today is the time for Revival and Spiritual Awakening. “TODAY IF YOU HEAR HIS VOICE, DO NOT HARDEN YOUR HEARTS, AS WHEN THEY PROVOKED ME” Hebrews 3:15 (NASB). (1) Kohen (Cohen). (2014, June 24). New World Encyclopedia, . Retrieved 01:14, October 1, 2014 from http://www.newworldencyclopedia.org/p/index.php?title=Kohen_(Cohen)&oldid=982590. What he has to say is too mind boggling to be made up. You can’t argue with his dates either. I believe we are living in the last days. It is supposed to be exciting but to me it’s scary. If you really want to know the truth behind Jonathan Cahn’s secret to his mysteries from a former member of his church, click on the link above. Thank you for your comment. I will research this as you have requested. I truly believe! I opened my bible to ephesians1:11 then prayed an repented. I then thought about JC’s book that I read. I opened my bible at random to Luke3:21. The Genealogy of Jesus. I feel The spirit of the Lord was guiding me. I pray that many more people will see the truth, repent an a revival will come. God has warned us all. I pray to find a church home that believes like we do soon. Thank you for your testimony. 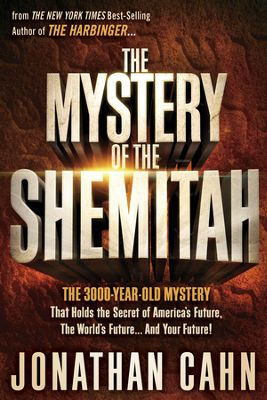 Jonathan Cahn sheds some light on many mysteries from the Lord. I will pray you can find a church home.